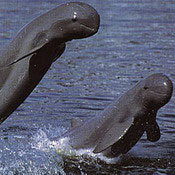 The Irrawaddy Dolphin is one of the most endangered in the world. Their preferred waterways are the coasts estuaries & rivers throughout South East Asia and Northern Australia. 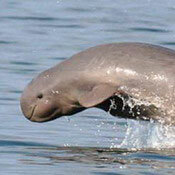 They like the warm shallow coastal waters and sometimes they are found in rivers as far as 1,300 km inland from the sea. 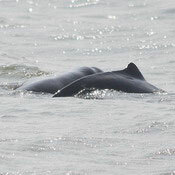 In the Bang Pakong River in Thailand, Irrawaddy Dolphins appear each November and stay until February searching for food, a mate and to give birth to their calves. They follow the pla duk talae or eel catfish into the estuary and it is their main source of food for the next few months. 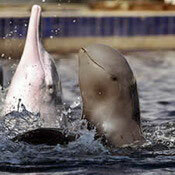 They are shy and will not swim alongside boats or humans, and when scared can dive underwater for twelve minutes. They are slow to surface and rarely make any splash with their tail to let you know they are there. 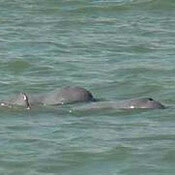 This reclusive behaviour makes it difficult to count exactly how many dolphins are present. The dolphins have a special way of eating catfish to avoid injury from the spiny catfish whiskers. One dolphin will seize the fish from the front, holding the head of the fish in the front of its mouth. A second dolphin will then start eating the fish from the tail end. They take it in turns doing this so that all can get their fill of fish. Catfish heads bobbing in the water is a good sign that the dolphins are around.